Dodgers Blue Heaven: Weekend Autograph Opportunities: The Famous San Diego Chicken! Weekend Autograph Opportunities: The Famous San Diego Chicken! Yes, you read this right. 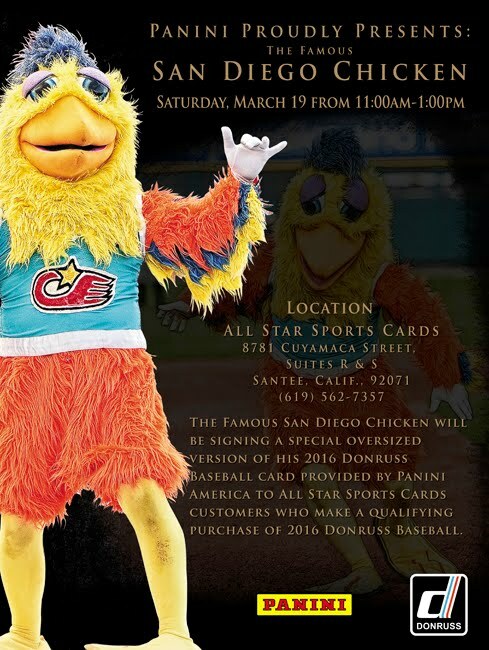 The Famous San Diego Chicken will be signing autographs in Santee in San Diego county this coming Saturday, courtesy of Panini America. In fact, they'll be providing over-sized cards for the chicken to sign. From what I understand, autograph availability is based on qualifying purchases of 2016 Donruss cards at the store. Go here for information.